Now you've done it: A customer is unhappy with you. Whether you fumbled an order, overlooked an inquiry, or mismanaged a message, there are times when you're going to dissatisfy someone. It happens. What happens next, though, will make all the difference. Whether the shopper is slightly annoyed or absolutely enraged, customers who feel they've been mistreated can become ticking time bombs. Here's what you need to do to diffuse the dilemma and regain their trust. First off, cop to the error. Don't waste time and effort trying to cover up a mistake. If you goofed, fess up and fix it. You'll actually gain a greater respect from customers. If you try to divert attention, or otherwise distract or deny the fumble, you're bound for trouble. In the old days, a customer who had a good experience with a business would tell three people about it. If they had a bad experience, though, they'd tell 10. Sure, you need to keep a lid on customers wanting to return goods or gain refunds at their own whims, but if this is a matter where you caused the mix-up, it's time do whatever it takes to make the customer happy. This means you'll want to offer quick exchanges or refunds, even to the point that you'll absorb any and all of the incidental costs (such as shipping fees). Bend over backward to demonstrate you really mean it when you say, "sorry we made a mistake." If the customer didn't get what he wanted or was promised, your job is to manage the damage containment. (You began the control with your admission of the mistake. Now you need to make sure it doesn't fly out of control as you work to rectify the situation). So after the apology, give the customer the option for a return, reimbursement or exchange for another item (possibly with a complimentary upgrade, if it makes sense for the situation). 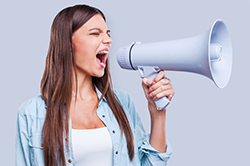 Your customers really have a great big stage to shout from if you don't work to resolve their issues quickly. Customers have a big voice today, much bigger than ever before. In the old days they might have threatened, "I'm going call the Better Business Bureau," and perhaps they would have. Today they say, "I'm tweeting about this or I'm putting on my Facebook page," and they immediately do—because they can. So you're still very much in damage containment stage here, if not back to damage control if the negative word has already been spoken in the social fray. If there's a complaint about you in the social-sphere, again jump into action to post a response that includes your regrets and your intention to correct the situation. While many businesses fear being exploited in the social setting, most will find that the well-responded-to customer will be just as apt to post a grateful message that praises you for your corrective action (and that, by the way, will serve as one of the best endorsements you could hope for). Most important when dealing with a social media kerfuffle: Don't openly pick a fight with an unhappy customer. It usually works against the "big bad businessperson," unfair though that may be. Instead, if you work to do the right thing to resolve the problem, you'll likely gain the approval of those bystanders who witnessed the whole thing. Really, this sort of public airing can turn out to your benefit. Once you've rectified the situation and have satisfied the previously dissatisfied customer, your work isn't done. The icing on the cake of contrition here comes from your following up with that customer. A short time after the problem has been resolved, check in to thank the customer again for his patience and understanding. Let him know you value his patronage and how rare the troubles he experienced are. This will further demonstrate that you're interested in your customer's satisfaction and are hoping to serve him again. Yes, sometimes a problem will arise, one created by you or your business team. Expect it and be prepared with a process that you can turn to quickly for steps to recovery. If you're prepared to do damage control, you're more apt to manage a situation with grace, ease, and efficiency—and that will help you move to soothe the dissatisfied customer and prove that it really was just an accident. Who can fault you for that?